On the final day of the TSSAA State Wrestling Tournament, the scene at the Ag Center is much quieter than normal as only 6 wrestlers from each weight class are left competing. Weigh-ins begin at 8am and the place is a who’s who of high school wrestling in Tennessee. Just two days before, on Thursday, 448 kids from AAA regions across the state came together to weigh in, all hoping to earn a state medal. The field thins quickly and after wrestling is over on day 1, HALF of them are out of the tournament. Friday thins the herd down even further and by Saturday night, only 84 kids remain. These are the state medalists. At the final weigh-in, there are numerous coolers and lunchboxes around and many wrestlers are anxiously waiting to have that final weigh in so they can finally eat without feeling guilty! Matthew was no different and wasted no time after weigh-ins getting some guilty pleasure food down. Jalapeño Lays Chips and chocolate milk…..at 8:05am. Whatever…. The championship match introductions started at 4:45pm and with much smoke and lights, everyone is introduced. Matthew’s match pitted him against Dobyns Bennet’s Alex Jeffers. 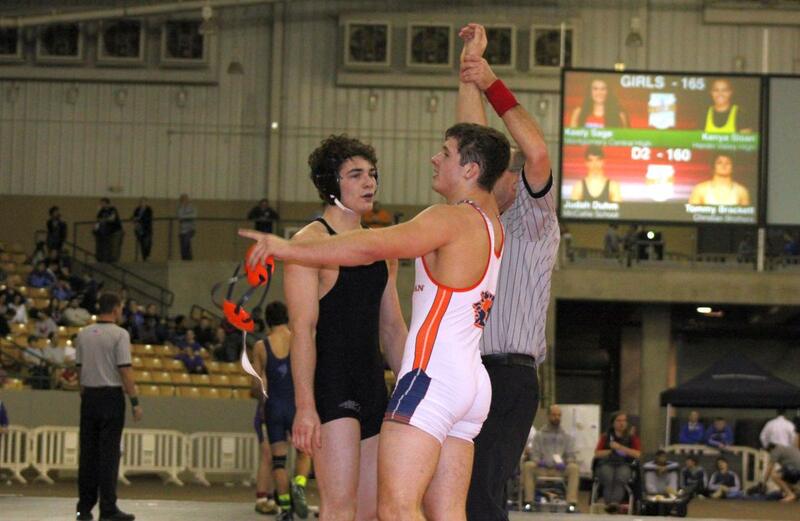 Jeffers is a senior who had over 30 wins but he was not the guy who Matthew expected to be wrestling. Soddy Daisy’s two-time state champ, Tucker Russo was disqualified after an illegal slam and sent to the consolation bracket. Sells and Russo had met earlier in the season in the finals of the GP West tournament and Russo won that match 5-3 in overtime. Certainly the fans wanted to see that match-up once again. You can only wrestle who they put in front of you and Sells and Jeffers was it. The match finally started and Sells was aggressive from the onset. He ran a Russian and ended up on an outside single which resulted in a takedown at 30 seconds. 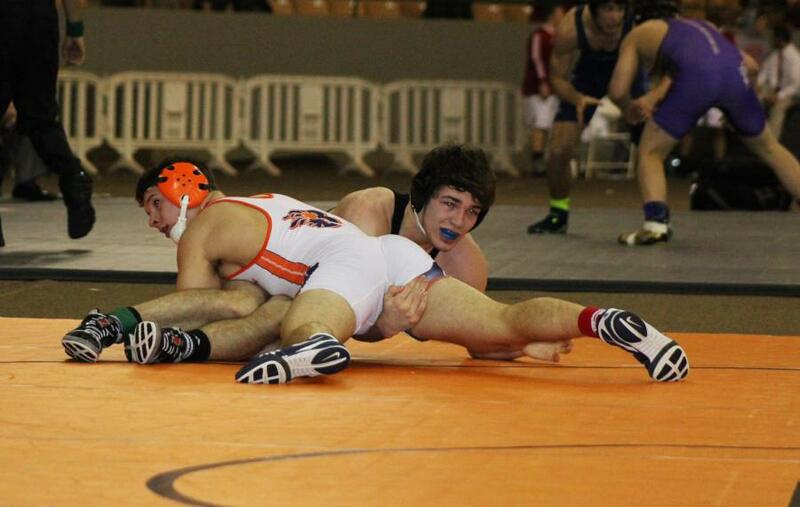 He rode Jeffers out and ended the first period up 2-0. Coach Bray put Matthew down and within a half minute, he earned a reversal on the edge. Score 4-0. He gave Jeffers an escape and in an ensuing scramble on Matthew’s shot, Jeffers was called for a figure four on the head. Score 5-1. From there Matthew earned another takedown and the second period ended 7-1. Sells was certainly in control and when Jeffers chose down in the third, Sells cut him. Matthew scored another takedown and gave an escape and when time expired the score was 9-3. With a final record of 49-2, Sells becomes Blackman’s 5th State Champion in the school’s 17 year history. And this is two years in a row that Coach Bray has had a state champ at 160 pounds. Asked what he was going to do since it was the end of the season, Sells said, “I’m not taking two weeks off. I’ll take one week, but not two.” With that attitude, we expect to see him competing on the same stage next season!